I've been on the fence about getting and Iron Maiden premium or pro. I've played both and think both are great games. I think I am leaning a little more towards the premium. The only thing I'm worried about if I get a premium is resale value because I took a pretty good hit when I sold my Aerosmith premium and it took a while to sell. I think resale value right now would be good on an IMDN since it's a new hit game, but if I get one it would probably be a while before I sold and I'm sure other new "hit" games would have come out by then. It might be difficult at this time, but anyone have any speculation what an IMDN premium would sell for down the road or now if I got it and had a change of heart? In my opinion I would buy the one that you think you're going to have the most fun with. Iron Maiden premium is a blast. I usually take some sort of hit when I sell my games. As long as it doesn't break the bank, I'm glad that I had a good time doing it. If you're that worried about it then why not wait to buy a used one and let someone else take the NIB hit? Seems like you want the NIB experience but don't want to lose money, usually doesn't work like that. I would expect a decent decline in resale value from ANY new game as so many seem to be coming out on a regular basis. That said, buy what you like, and maybe consider trading a better option down the road. I think I would have more fun with a premium and why I'm leaning that way. I don't mind taking a hit, but it's tough to take an $800 hit like I did on AS when I've only put a few hundred plays on a game. I'm not into pinball to make money and if I break even or lose a few hundred I'm good with that and kind of consider as rental money. Seems like you want the NIB experience but don't want to lose money, usually doesn't work like that. I don't really care about the NIB experience, done it quite a few times, to me it's not all it's cracked up to be and definitely not worth the hit you take come resale time. I've been pretty lucky and bought quite a few games with under 100 plays on them in the past and hope that will be the case and I can find a used IMDN within driving distance. Nope, see post # 8, really could care less about NIB experience. Why are you buying a game with plans of selling it anyway? I never buy a NIB game with intentions of selling it but if i do, I definitely expect to lose some money on it. Because I have limited space and grow bored of games after a while. Oh ok. Well i think IMDN is going to keep you entertained for a long time but id still look for a used game since you most likely will be selling soon. How many games do you have room for? I think it would probably keep me entertained for a while also. I much more than likely will hold out for a used game. I'm not sure I'll be selling soon, but a day will more than likely come when it's time to sell. Not sure on game capacity, I could fit a few more in the basement with some re-arranging, but once games go in the basement I don't play them as much and that is where I have my EMs and SS games. If you can't stomach losing 1k on resale, than you shouldn't be buying NIB. Just buy another used pin to pacify you until there are a ton more IMDN out there and you'll find one for sale and let the other guy can take the hit for you. That's the price of buying NIB. You already discovered that with your AS experience. Buy the Premium, lose $1000 in a year after you've mastered it, create a new post bitching about it on Pinside. Yeah, a grand is just too much for me to justify losing on resale. I almost sold my Mustang I bought NIB and was going to take a good hit on it so I ended up keeping it. Good point about just buying a used pin to pacify me until there are more IMDN available used. I had a similar thought that I just need to get back into some of my other games and cool my jets on getting an IMDN until there are more available. I was also kind of looking to find out what people thought a fair price was for a used IMDN premium, but another pinsider said most premiums end up at $5800-$6500, not sure where IMDN will fall in that range, guess it really depends on how long I wait and how many pop up for sale. 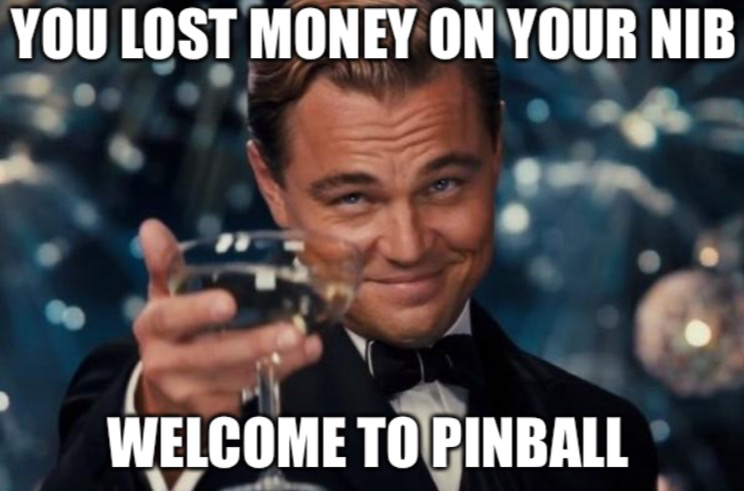 Maybe you should keep your eyes on pinball shows by you and see if you can snag a demo game for less after show. Dont buy nib if your worried about resale value.... bc your gonna lose 500-1000 depending on title and how popular it has become or hasn't become. Its the reality now with prices as much as they are. Contact Marco Specialities or similar vendors with a big presence at your local shows, and see if the have a show game program. I got my IMDN pro as a show game from Marco at SFGE and basically saved the entire NIB hit - I think I got around $800 off for a game with 300ish plays on it. I was also credited with being a game bringer and got admission to the show everyday for free. Another $50+ benefit. At this point I think I am going to quit torturing myself watching IMDN videos; I already know I like the game and would like to own one. I am going to focus on getting better at some of my current games until I find a used IMDN. Check with dealers, a few often have demo games for $400-$500+ off with a few hundred plays. I did talk to one dealer, he said he had a demo game for $6900 shipped. Didn't seem like a good or bad price. I guess that would be $400 off since street price is $7300 for a new one. Only on Pinside would someone expect to buy a product, use it for a year, then sell it for the same price they paid for it. yep, I pretty much always plan on taking some sort of loss on a game, just try to minimize it as much as possible which is why I will not be buying NIB. Thats not a good deal in my book. Id stay away from that distributor. I agree and that's why I didn't go for it. They are actually a reputable dealer, I don't want to say who it was, but this deal didn't seem that good. That brings up something else I wanted to hear from people on- what would be considered a good deal on a used game? I was thinking $6400-$6600 right now and probably less as time marches on and new titles come out. Wow $1000 hit after having it a year.....its amazing what is clearly forgotten which is the shipping!!! Right off the bat you might as well subtract $400....So its costing you $600 when you resell it....So whats the big deal you paid $600 to enjoy a game in the convenience of your home go play at any time your hearts desire.Too bad you sold your AEROSMITH because they had a HUGE MEGA UPDATE and the game is AWESOME and very SATISFYING. $6k or under would be a good deal. Otherwise, it would just be better to buy a brand new game that no one has messed up with Cleaner Wax, sticking dolls on the top, or bedbugs. Are you telling someone that $6500 for a used Maiden is a good deal??? What are premiums selling for new? Shipped direct or picked up at distributor? And I’m not talking Whysnow “ I get a better price than everyone else does pricing”. Last NIB stern I bought was MET road case so it’s been awhile. As for value used. Nobody knows and if they think they do it's all speculation. I know about Aerosmith! I heard about the new code this past week and it sounds good, but when I had it I played it for a couple months and it got BORING due to the code that was on it. Which you make a good point about not buying games until they are a couple years old, which is ultimately what I did; sold AS to get ACDC premium. I do however feel the code is pretty good on IMDN as it is and I would expect a few updates to be coming to make it even better. I don't think a $600 loss is too bad on a NIB game, but I think it would be more than that and like you said add $400 if someone wants it shipped which doesn't make it worthwhile to a potential buyer. I believe new they are going for $7300 shipped now after their last price hike which I'm not sure what it was anyway, maybe when Deadpool came out? If you have people skills, you can also add your machine to an operator's order. Ops get tasty discounts because they buy a dozen machines at a time. Real ops only deal in cash, so don't try to hand them your plastic, they will slap it out of your hand. You will need a vehicle to take the game from their warehouse, bring your own helper. Vid Approx what would you estimate the add it to their order/pay-cash/pick it up in your vehicle at the distr price might be? I’m sure the amount would partially depend if a customer had already made several/ many purchases from the same distr. Fun. And play the hell out of it!! You will. You’ll lose much less on the pro. It’s just as awesome. Up here games are a buck a play (sometimes 2) so I look at it if I loose 500-1000 on a game, hopefully I had 500-1000 plays so the loss would be the same as playing a routed game! Probably the most sensible post ive ever seen from you PW, way to go buddy! It's not a thousand dollars, but a few hundred dollar savings is certainly real money.